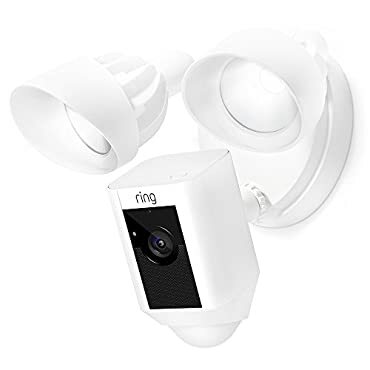 Protect your home with the world's only motion-activated security camera with built-in floodlights, a siren alarm and two-way audio, so you can see, hear and speak to anyone on your property from anywhere. With object and facial detection, floodlight cam has the most advanced motion sensors in home security. Its 270 field-of-view will let you detect motion around corners and monitor all your blind spots. Floodlight cam easily replaces existing wired floodlights and connects to standard junction boxes. With the app, you can flash the lights, sound the alarm and zoom-in to focus on your most important areas. Floodlight cam sends instant alerts to your smartphone, tablet or pc whenever it detects motion. And from the free Ring app, you can protect your property and monitor your home from anywhere. Store: Fuller Electronics and more Condition: Brand New Price: $199.95 Total Price: $199.95 Buy It from Fuller Electronics and more No returns. Store: pawn5star Condition: New (Open Box, or other) Price: $200.00 Total Price: $200.00 Buy It from pawn5star No returns. Store: sabrastuff Condition: Brand New Price: $214.99 Total Price: $214.99 Buy It from sabrastuff No returns. Store: arrennchor_0 Condition: New (Open Box, or other) Price: $180.00 Total Price: $180.00 Buy It from arrennchor_0 No returns. Store: BestBuysRHere4Now Condition: Brand New Price: $200.00 Total Price: $200.00 Buy It from BestBuysRHere4Now No returns. Store: Every.Day.DeaIs Condition: Brand New Price: $209.99 Total Price: $209.99 Buy It from Every.Day.DeaIs No returns. Store: darxwizard Condition: Brand New Price: $195.00 Total Price: $195.00 Buy It from darxwizard No returns.